Our pet policy is to welcome them on most of our houseboats! Pets are part of the family and find houseboating and exploring the shoreline extremely fun. Most dogs love water, swimming and sunning themselves on deck. When it comes to safety, we don’t provide life jackets for fido, so please come prepared if your pet is timid in the water or simply for safety for peace of mind. If your pet happens to cause damage and/or the need for extra cleaning, part of your deposit may be forfeited to cover this additional cost. At least ­one World War II boat dog, a Great Dane on board a Royal Navy of South Africa ship, was trained to recognize enemy submarines. Some hunting dogs, such as the Newfoundland, have been bred to dive into water and retrieve game. The Portuguese water dog even has webbed feet to improve swimming. Dogs have been trained to rescue others. One smart Border Collie even rescued herself from a shipwreck by finding an air pocket inside the overturned ship and riding the wreck to shore. ­Considering all that animals provide on the water, it shouldn’t be a problem to take your pet on your next boating excursion, right? Be sure to make your boat pet friendly and safe. The following are some suggestions when you take your pet on your own boat, and remember that houseboats.com allows pets on most rental models. You may not be able to acclimate your pet before-hand, but the suggestions may be helpful for rentals as well. 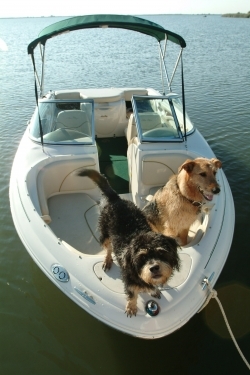 Just as you pet-proofed your house and garage, you’ll need to pet-proof your boat. Assume that your pet can — and will — get into trouble. You can’t foresee everything, but you can train yourself to look at your boat as a cat or dog might. What smells interesting? What has fascinating moving parts? What looks or smells like food? Where’s a good place to hide? You’ll also need to make your pet boat-friendly. Give your pet a chance to get used to the boat. Weeks before the planned trip, start making visits to the boat — either in the dock or on the trailer. Take a tour of the boat with your pet carefully leashed or harnessed. Let your pet sniff around, explore and get used to being on the water. As you’re getting your pets acclimated to the boat, you can also help them get used to their PFDs. 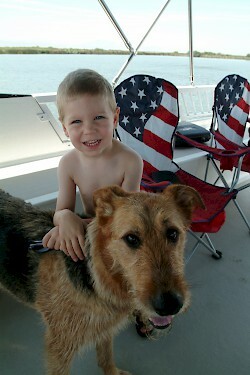 You should have a pet flotation device (PFD) on hand w­hile boating with your pet. Each pet on board should have its own PFD. Jones Valley Resort’s marina store sells pet PFD’s. 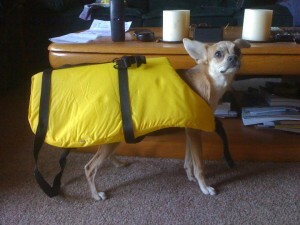 Give your pet a chance to get used to wearing its PFD long before you board the boat. Let the pet wear it at home — just for a few minutes at first. Increase the amount of time the pet wears the PFD as your departure date approaches. By the time you get to the dock, the PFD should seem familiar and unthreatening to your pet. All pet flotation devices should have a handle on the back that rests between your pet’s shoulder blades. That’s so you can lift the animal out of the water if the need arises. Before getting into the boat, make sure you have practiced this maneuver a few times so you and your pet can get used to it. You want to make sure you’re strong enough to rescue your pet if you need to. Your pet also needs to feel somewhat comfortable with being carried like this — or comfortable enough not to squirm violently. Don’t forget your own life vest and one for each person aboard! Please note: the dock and parking area can be extremely hot for pets’ paws in peak season, please plan accordingly. Food and water. Bring more water than you think you’ll need, just in case. Chances are that you and your dog will be out in the sun more than either one of you is used to. Newspapers or a doggie toilet. This clearly represents hours of training, frustration and mess. Your dog probably won’t get it right every time. You already know your dog’s warning signs, so accompany it as you would on a walk and clean up any messes. Doggie snacks. You should always have treats handy to reward your dog’s good behavior. A carrier, harness or leash. Even at a dock, you have to comply with local leash laws. Please remember that Health Ordinances do not allow pets in marina stores. Transportation. You’ll need an easy way to help your dog get out of the water and on board — either a dog ladder or a dog ramp. A dog ramp is a collapsible floating ramp that you attach to the deck; it creates a slope that mimics the shoreline. Older or overweight dogs may prefer ramps. Houseboats.com provides ramps to all models in the fleet. Proper paperwork. You’ll need up-to-date papers and vaccination records. Boating with pets takes patience and preparation, but when you and your best friend are out on the water, you’ll be glad you did it!